Young French filmmaker Guillaume Bodin has produced a video on the world of biodynamic wine. Entitled La Clef des Terroirs, the film is scheduled to be released on DVD for North American audiences at the end of the year under the title Wine: The Green Revolution. Read about Bodin's passion for this wine and about the biodynamic wine movement in France in this month's Paris Insights. We recently learned that a barge makes bimonthly trips to Paris to sell wine that is produced around L'Yonne, a French administrative département that lies to the southeast of the city. Read about how it is now possible to purchase wine from this vessel when it docks along the canal in this month's Paris, Past and Present. Last month we dined at Café Noir, a restaurant that stands at the intersection of two cobblestone streets in the distant 20th arrondissement of Paris. 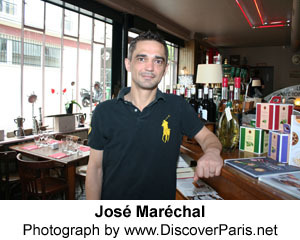 Read our review and meet chef and proprietor José Maréchal this month's Le Bon Goût. January 2012 - Will the Last True Parisian to Leave the City Please Turn Out the Lights?